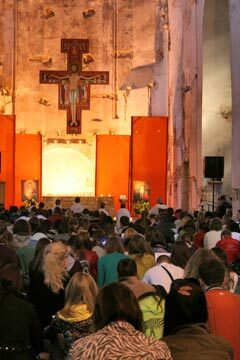 From May 1-3, 2009, 8 000 young people attended the meeting organized in the capital of Lithuania by the Community of Taizé in collaboration with the youth centre of the archdiocese. More than three years ago, the brothers had been invited to hold a stage in the pilgrimage of trust on earth there, at the initiative of Cardinal Backis. In his words of welcome, he stressed: “I think that jubilant Vilnius, thanks to you and your presence, will show its hospitality.” And indeed, the welcome of a whole city exceeded all expectations. What was at first very striking was to discover that reconciliation is possible. Despite the vagaries of history, young people from countries so close and yet often quite distant gathered to share what really matters. 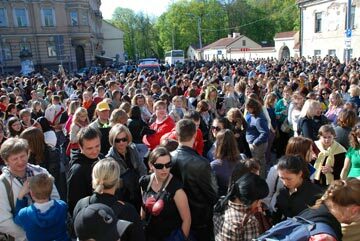 Thirty host parishes, and hundreds of families of Vilnius and the surrounding region, offered hospitality to young people from all the neighboring countries, but also from several countries further away. What a sign of peace in the human family to hear, in the prayers, readings following one another in Lithuanian and Polish, in Belarusian and Latvian! The whole city was mobilized to welcome these passing guests. Official information panels gave the program of the prayers and workshops; large banners greeted the pilgrims in front of the main churches, and a park was reserved in the heart of the city for the distribution of meals: a pastoral setting beside the small Vilna River to share hot food prepared by young people and soldiers. The joy of being together could be seen on many faces. 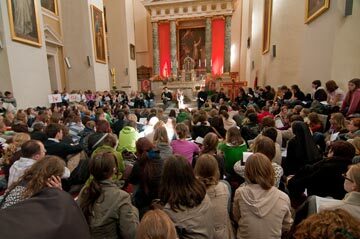 In the course of the afternoon, the young participants and the townspeople gathered in various locations for workshops on very diverse topics: in the cathedral, they were invited to reflect on God’s call; in the Lutheran church, on the role of singing in faith; in a museum dedicated to the memory of the Soviet regime, on the weight of the past in contemporary society; at the Orthodox cathedral, on the icons and examples of liturgical chant of Greece, Georgia and Russia; in a theater, on the various folk traditions, including Jewish; in the streets, they could meet the disadvantaged with volunteers with Caritas, and with a Faith and Light community, that also welcomed a group from Moscow. When the time came to leave, young people and families said goodbye not without emotion. Some did not hide their sense of having lived a very special moment, or even an event of “historic” proportions. Indeed, this was probably the first time that thousands of young Christians of different denominations could come together, from Poland and Russia, Latvia and Ukraine, Belarus and Western Europe, all hosted by the Lithuanians in their festive capital. These thousands of young people seeking reconciliation and building together the communion of the Church during these days were a real sign of hope... a sign that a future of peace is possible.